This three bedroom Victorian cottage has two sitting rooms, large well equipped kitchen, and a private garden (ideal for alfresco dining). The village shops are a mile away. It is in close proximity to the market town of Horsham and 30 minutes to the coast. The downs Link is half a mile away and there are golf courses and lovely walks nearby. The are many country Pubs and restaurants in the area including fine dining. Large family bathroom with separate shower, jacuzzi bath also with shower , wc,sink hair dryer. Down stairs cloakroom. Large well equipped kitchen with an oak table that seats 8. Large fridge freezer. dishwasher, induction hob with extractor, oven microwave,deep fat fryer, grill, toaster etc. Numerous Golf courses within a short driving distance. Outside: Small private garden. with deck table and chairs, barbecue, secure for pets and children. Use of owners fire pit for late night toasting of marshmallows Utility Room: Utility room with washing machine, tumble dryer, iron, ironing board and sink. Cleaning / Towels / Linen / Maid service: Linen and towels are included. Cleaning and towels and linen weekly. Other: Sun room ideal for morning coffee, Table chairs and coat and shoe storage. A good place for your pet to sleep. I used this property to stay in the night before my wedding as I was getting married in a nearby Church. I wanted a place for my bridesmaids and I to stay and get ready in the morning. The owner left me a card and a bottle of fizz to say congratulations and was so helpful during the booking process. The cottage was perfect for our needs and has a huge bathroom and a very handy keypad entry door so you dont have you worry about keys! The cottage is absolutely beautiful and the perfect place to spend Christmas. We were met by the owners who were very welcoming and had left a lovely welcome package with treats for everyone including our six month old Grandson and our daughter's guide dog.The kitchen had everything we needed to prepare Christmas dinner for ourselves and family members who visited us on Christmas day. The rooms are very warm and comfortable and we felt very much at home. The beds were very comfortable and we had plenty of towels. The cottage was decorated for Christmas with lovely lights, decorations and a beautiful Christmas tree, there was also a Christmas tree with lights outside the door. We all have a fantastic time with lots of lovely walks in the area and visits to local venues. We hope to return in the summer with our bikes and try out some of the cycle routes near by. The Cottage was perfect for our stay over the Christmas holiday. It was so welcoming and warm with everything looking so clean and tidy. It had a little garden which was safe for our dog and situated at the end of a very quiet lane. One of the benefits for us was having a utility room so that we could store all the food we had brought with us for the festivities. The kitchen was extremely well equipped. This is a good place to stay if you like walking and is situated near to a lot of interesting places to visit. 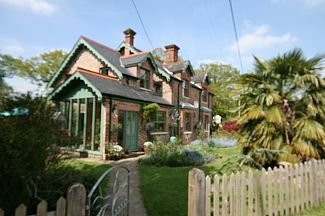 A fabulous cottage... well equipped, beautiful, comfortable and clean. Hosts were welcoming and informative...thank you. Location is perfect and close to many attractions. A wonderful experience. Thank you. The coast is 30 minutes by car. Car Essential. Twenty minutes from Gatwick, one and a half hours from Heathrow. Channel ports within one and a half hours. The village of Southwater is 1 mile. The delightful market town of Horsham is 4 miles. London is 1 hour by train. We are central for all gardens, castles, National Trust Property's' and many other attractions such as Chessington, Thorpe Park, Peppa Pig World etc.